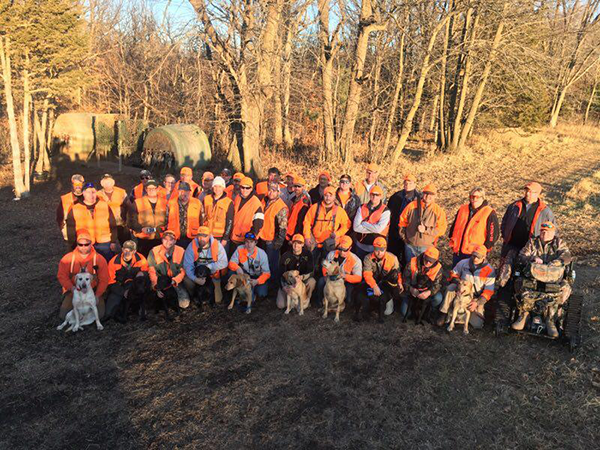 Trained retrievers and dog handlers, cleaned birds, and a King’s Feast with beverages after the hunt. Book your hunt for this season, it will be a blast. All you need to bring is your gun and plenty of shells. The European Hunt consists of 10 different shooting stations surrounding a release area in the woods. Hunters will rotate from station to station so they can experience all of the unique shooting challenges that each station presents. Birds will be flying up to 175 feet overhead - over the tops of the trees and various hilly and open terrain for an exciting and challenging shooting experience. Hunts will have up to 30 people (three per station) and all birds shot will be divided up equally among all shooters. There is a minimum of 200 birds, the max is up to the amount of shooting your shoulder can handle! For hunts over 20 birds per person please call for pricing. The European Hunt is great for corporate outings, fundraisers, bachelor parties, birthday parties or just a fun get together for families and friends. All shooting stations are handicap accessible. End of season blowout! Come out and take advantage of this last opportunity before the season ends! If you want to schedule your own European Hunt on any date or start time that works for your group of 10-30 shooters, give us a call and we will make it happen.